Is it time to paint your ceiling? Whether your ceiling paint has yellowed due to everyday wear, or you are choosing a new color to add some character, contacting a professional painting company is essential if you want to expertly revive your ceiling and enhance the look and mood of your home’s interior. But what color should your ceiling be painted? While the answer to this question depends on the painting technique you’re going for, and your personal taste, the following painting rules can help you choose the right shade for any room. Small rooms. Selecting a darker paint color for the ceiling and walls in a small room will envelop the space in rich color and make it feel more intimate. But if you want a small space to feel roomier than it actually is, opt for a lighter color for the walls and ceiling. Bathrooms are a perfect example of using the same color on the walls and ceiling, thus simplifying and making the room feel bigger and more modern. Large rooms. In a larger space, choosing a seamless look with either darker or lighter paint colors will unify the room and bring focus to your furniture and decor. Asymmetrical, vaulted, or angled ceilings. Using the same wall paint color for these types of ceilings can help simplify the shape of the entire room you’re painting. Try a darker shade for a cozier space, or something lighter to open things up. Ceiling Painting Tip! Painting your ceiling and walls the same color works best in rooms with flat ceilings as opposed to those with scalloped texture. You desire a low-contrast look. You like simplicity and subtle tone changes. The wall paint color you choose looks perfect when lightened for use on your ceiling. There is a chance the wall paint color you’ve chosen won’t look as nice when the color is diluted. If this happens, you may need to choose a different color for your walls and ceiling, or try an alternate ceiling painting technique altogether. You want to make your room feel cozier and more intimate. A darker paint color will create the illusion of a lower ceiling even if it’s particularly high. Exposed basement ceilings are a good example of using a flat black paint to make it feel like an industrial pub-like setting. You want to accent crown molding or other decorative trim. Darker colors on ceilings can help create contrast and make these beautiful details pop. Your room has white walls. If you’re feeling bold, choosing dark paint for the ceiling will give the room striking contrast you’ll love. Ceiling Painting Tip! Try dark colors like charcoal grays, navy hues, or chocolate-brown shades on rooms with white walls to create a dramatic, contrasted look. A flat black can also be timeless when you have exposed ceilings. The room is filled with bright colors. Do you have a lot of color going on in the room in terms of furniture, paint, decor, or upholstery? The best thing to do in this situation is to choose a white hue for the ceiling. If you decide to paint your ceiling any other color, it likely won’t blend well with the rest of the room. You are painting the ceiling of a primary living area. While dark or light colors on the ceiling can often create sophisticated charm and enhance certain rooms, there are times when white is best. This is especially true if you are painting main living areas such as the family room or kitchen. If you value simplicity in these areas, white will likely be your best bet. Your ceiling is textured or has visible imperfections. Choosing flat white paint in this case will help disguise any lumps or bumps along the ceiling. A color would actually enhance what you don’t want to bring attention to. The room doesn’t get a lot of natural light. In rooms that don’t get much light, white ceiling paint is best as it works to reflect more light into these darker spaces. Ceiling Painting Tip! If your walls are white and the ceiling has a flat, smooth surface, consider painting your ceiling a softer color such as a lighter peach, a sky blue, a very light gray, or a pale yellow to give your space a breezy feel. It’s the next best thing to white! Further, a sky blue ceiling on an outside screen porch or three season room will give you the feeling of bringing the outside into your room. 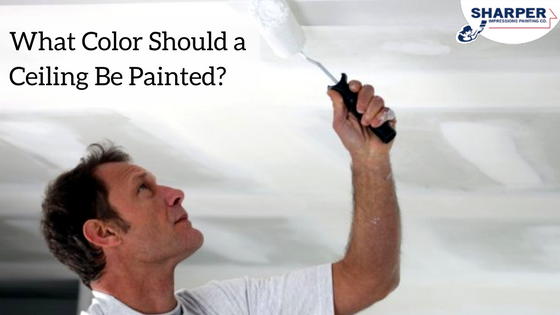 Deciding on the right paint color for your ceiling is just the beginning. Once you take the time to choose the best color and painting technique for your ceiling painting project, you want peace of mind that everything was painted correctly. Choosing to hire professional painters will ensure that your ceiling paint looks pristine and enhances the room perfectly with no messes below.